e-Pengeluaran is an EPF’s electronic services allows members with RHB Bank and Maybank housing loans to submit withdrawal applications online in a fast, accurate and convenient way. 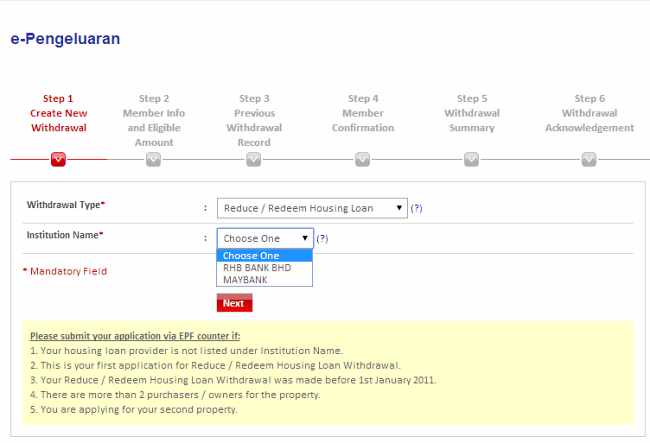 The online facility, which is linked to EPF’s i-Akaun, assist withdrawal applications for repayment of housing loan monthly instalments and to reduce or redeem housing loan balance. Bear in mind that, members must be a registered i-Akaun holder in order to utilize this service. For the time being, the facility available to only housing loan with RHB Bank and Maybank but EPF plans to extend this service to housing loan with other banks soon. However, this is some limitation for this facility where it is only applicable to members who have already made the same withdrawals, members must be the buyer and the owner of the house as well as the borrower. 1. Your housing loan provider is not listed under Institution Name. 2. This is your first application for Reduce / Redeem Housing Loan Withdrawal. 3. Your Reduce / Redeem Housing Loan Withdrawal was made before 1st January 2011. 4. There are more than 2 purchasers / owners for the property. 5. You are applying for your second property. To submit the application member has to login to i-Akaun, browse to Withrawal Tab & e-Pengeluaran. You will be presented with 6 steps application. Once submitted, EPF will then verify the housing loan with the participating banks and ensure all terms and conditions for withdrawal have been met. After that, members will be informed to verify their thumbprint at any EPF branches before disbursing the money to members via direct credit facilities. Does EPF Scam Us on Monthly Housing Loan Repayment Scheme? saya yang bernama tersebut diatas,mengeluarkan KWSP mengenai online sistem untuk berbayar secara ansuran bulan pinjaman perumahaan.